The 6th Bomb Group: Flight Crew 4012? Crew #4015. Cpt Cecil E. Patterson, Jr.
Cpt Cecil E. Patterson, Jr. (A/C) was a veteran of the 8th Air Force. 2/Lt Maurice Logsdon (from Crew #4018) took the place of Cpt Harry G. Gillum (Bombardier) for about 5 missions following the March 27 mission. Crew #4015 in front of their plane. For extraordinary achievement while participating in aerial flight 27 March 1945. These individuals, were combat crew members of a B-29 aircraft based in the Marianas Islands on a mine-laying mission to the Shimonoseki Straights between the main islands of Kyushu and Honshu, Japan. The purpose of this mission was to tighten the blockade of Japan by closing the Shimonoseki Straights to shipping. The flight involved crossing the main islands of Japan on the way to the target and on the return, in each case exposing themselves to attacks by fighters and flak from the ground, as well as anti-aircraft defenses of enemy naval units in the inland sea. Despite engine failure at the approach to the mine field, this crew continued toward the target through searchlight-directed flak, but a malfunction prevented the mines from being released. The trouble was remedied, and they made a second run over the mine field. The mines were dropped in the exact location specified, and this crew, by skillful evasive action, flew their bomber from the area without damage. During the entire mission each of these veterans of repeated combat missions against the homeland of Japan displayed professional skill, teamwork and devotion to duty, thereby contributing materially to the successful blockade of the Japanese homeland. Their actions reflect great credit on themselves and the Army Air Forces. A separate DFC Citation was prepared for Captain CECIL E. PATTERSON, Aircraft Commander of Crew #4012. This crew originally flew Banana Boat. 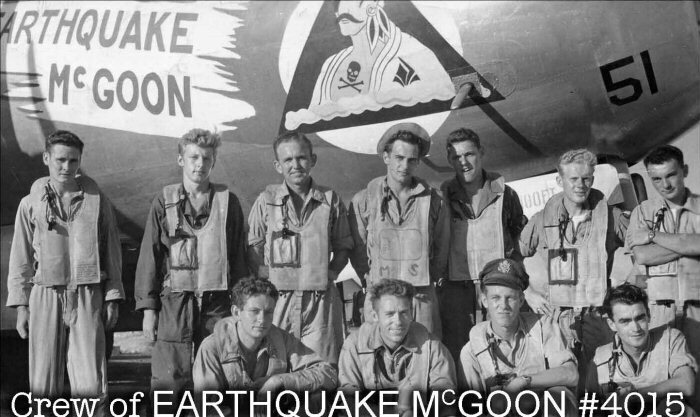 They later flew Earthquake McGoon.